The process of casting on is the same with circular needles as it is with straight needles. The only difference is that your pattern will usually say something like "join stitches in the ​round being careful not to twist stitches." What does that mean, and how do you do it? It's actually very easy but you do need to pay attention because it is also easy to get a twist in your knitting. The first key is that you need to look at all the stitches you've cast on and make sure they're all oriented the same way on the needle. That means all the little loopy bits from casting on the stitches should be on the inside of the circle made by the circular needle, without twisting the edge. Then you can make the join and knit as your pattern lays out. If you don't do this correctly, you will notice it pretty quick because your knitted tube won't be straight. Unfortunately, the only way to fix a twist like this is to rip it out and start over, so make sure you get it right the first time. Of course, you can always use the twist as a design feature, as in the faux Mobius infinity scarf. That's not going to work for your socks, mittens, and hats, though. There are several different methods for joining a project in the round. Some people simply start knitting, using the slip knot or first cast on stitch (whatever the case may be) as the first stitch. You can also cast on one more stitch than your pattern calls for. You will then slip that stitch onto the left-hand needle and knit the first stitch and the last stitch together before starting the pattern. Slip the last stitch (that is, the first one cast on) from the left-hand needle to the right-hand needle. Then lift what's now the second stitch on the right needle (the last one cast on) over the first stitch and onto the left needle. Pull tight and start knitting with the stitches that are on the left-hand part of the needle. The biggest problem with knitting in the round is remembering where the round begins. That is why a stitch marker is very important whenever you're working in the round. Place a stitch marker on the right-hand needle before you start knitting but after you make the join if you are crossing stitches. This marks the end of the row, which will help you keep track of your pattern. 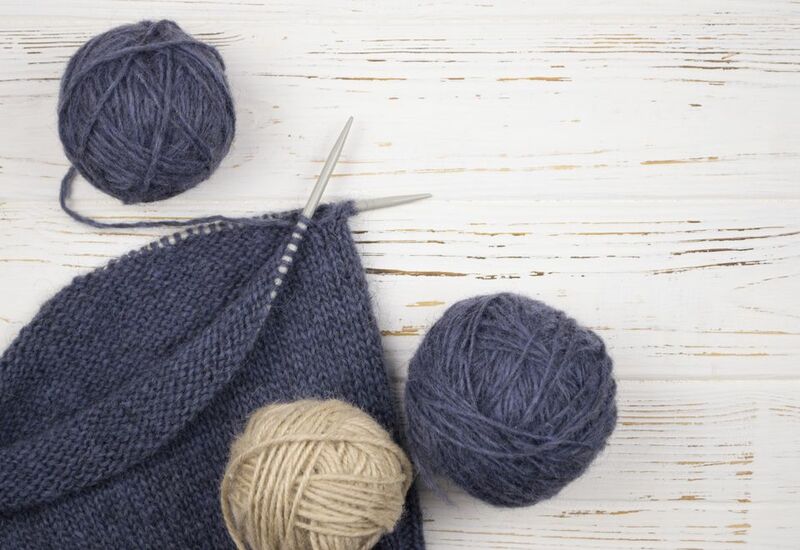 Because a stitch marker kept on the needle can fall off if you stop knitting right after it, you may want to place the marker before the last stitch. Many knitters also choose to knit the first stitch of the next round before putting the work down. You just have to remember that you did this when you pick it back up. Alternatively, you can use a stitch marker that can loop around a stitch rather than living on the needle. You'll want to move it up every few inches so you can still see it, but that takes the worry out of losing it if you stop your knitting right after slipping it.